It's an awesome idea that collapses in the execution. 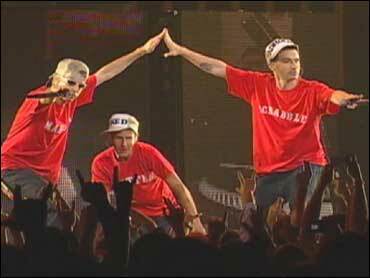 The Beastie Boys handed out video cameras to 50 fans and told them to go wild gathering footage of their sold-out October 2004 Madison Square Garden show. The intention was to capture an authentic audience experience. The result is the almost unwatchable "Awesome: I ... Shot That!" The documentary is an "authorized bootleg," as the rap group is calling it, offering an innovative contrast to more traditional concert films from established directors (Jonathan Demme's "Neil Young: Heart of Gold," Michel Gondry's "Dave Chappelle's Block Party"). People are constantly stealing entertainment anyway; why not just go ahead and let them do it and take away the thrill of the wrongness? But because these are fans behind the cameras, as opposed to people who do this sort of thing professionally, the video is usually headache-inducing in its jerkiness. And the strobe effects and frantic edits certainly don't help, the cuts coming as quickly as Mixmaster Mike works the turntables. (One thing you do walk away with is an appreciation for the DJ's work; it's a miracle he doesn't suffer from carpal tunnel syndrome, his fingers move so nimbly as he cranks out the group's signature samples and scratches). Adam Yauch - better known by the name MCA - directed the movie under the pseudonym Nathanial Hornblower, and he's unfortunately fond of the same psychedelic, gimmicky '70s effects often featured in the group's videos. The thing is, the Beastie Boys don't need all that visual trickery and embellishment. Rap concerts can be incredibly dull, but as Yauch, Mike Diamond (Mike D) and Adam Horovitz (Ad Rock) work their way through hits including "So What'cha Want," "Brass Monkey," "Sure Shot" and "Sabotage," they reveal once again that they're a complete blast to watch, especially while basking in the adoring vibe of their hometown crowd. At the top of the old-school "Paul Revere," all Ad Rock has to do is say the first word - a long, nasally "Nowwwww ..." – and from there, literally every single person recites every single word, almost totally a cappella. Among those die-hard fans singing along in the audience are Ben Stiller and his wife, Christine Taylor, who proclaim afterward that it was the best show they've ever seen (and that they can't hear anything - the bass is so insistent, you can feel it thumping beneath you even in film form). Also in the crowd is Darryl McDaniels from Run-DMC. That shows the transcendent allure of the Beastie Boys, and it's one of the more evocative elements of the movie. Black, white, Asian, Hispanic, male, female, famous and not-so-famous - the rap group appeals to them all, with a fan base as diverse as New York itself. And it looks like they all saw an amazing show. Too bad the movie didn't do it justice. "Awesome," a ThinkFilm release, is rated R for language. Run time: 90 minutes. This reviewer awards it two stars out of four.